Keeping in mind that travel doesn’t merely broaden the mind, it makes the mind, my friend Petra and I jumped on the train to see what we could see and eat what we could eat in Barcelona, capitol of Catalonia. We went mad and strolled (dripping with sweat – heat wave in Europe right now) to cooking classes, food tours, fashion tours, cheap tapas bars and expensive starred restaurants. Traditional Catalan recipes are based on what you find at the market – ingredients from the farm and the sea. I noticed that it was similar to the way we cook in the Roussillon and in fact it does share roots. They eat a lot of cured ham, cheese, seafood, sausages, sauces, rice and vegetables. They have tomatoes coming out their wazoos and put them on and in everything. It is really hard to go back to a tartine (baguette with butter) once you have become hooked on pa amb tomàquet – thin grilled bread rubbed with olive oil, garlic and fresh tomato. When I got home to Uzès I was overcome with the desire to repeat the flavours I had spent five glorious days tasting. I threw a veal chop on the grill drenched in Catalan olive oil and hot smoked paprika and fried a bunch of padron peppers with lots of flakey salt. Flushed with flavour overload I bought some slightly underwhelming figs which were drastically improved with a marination in Pedro Ximénez sherry, saffron, vanilla and sugar. But I kept thinking about the tomatoes so set myself to concocting that sunshine in a bowl, gazpacho. 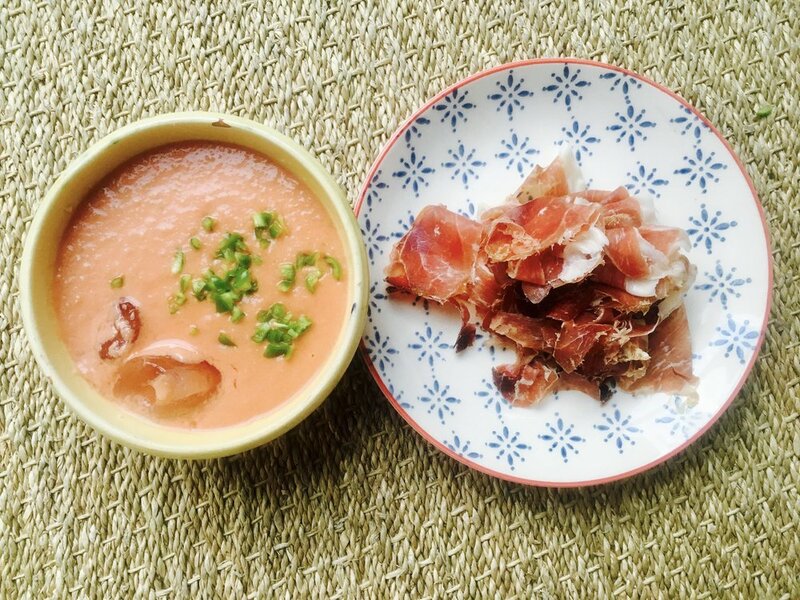 Gazpacho soup in Spain is deep salmon pink, not red and it is very smooth and medium thick – you can add as much water as you like. Some people put vinegar in it, some don’t. At the cooking class we learned to just slice the juicy ripe tomatoes in half and grate them. You chop up green capsicum, onion, garlic and cucumber and add it to the tomato pulp along with olive oil and vinegar. Then you can either blend and strain it immediately and chill for at least a few hours or chill as is and blend later. Bread soaked in milk or water and blended in thickens it. I like to serve it with an ice-cube in the bottom of the bowl and eat it with finely sliced Pata Negra cured ham. Some people decorate it with finely chopped pepper, onion and cucumber. I also did a version with a courgette and flower. Bon profit!